Pond snail (Radix labiata), a fresh water snail. Abalones (Haliotis thailandis), are sea snails (shells). Picture by friendly courtesy of Jeffrey Jeffords. Species number of molluscs. Diagram. Snails are among those animal groups everybody knows. After rain snails can be seen crawling around on bushes, trees, walls and roads at a proverbially slow pace. The Roman snail (Helix pomatia) is a common and well known snail species. This largest native snail (10 cm body length and 4 cm shell diameter) can be found especially in bushes besides roads or on the wood front, where it crawl around mostly in the cool evening hours. If we take a closer look we also find snails on tree trunks in the forest, under decaying wood, on walls and rocks faces. Snails can also be found in settlements and gardens. That is where snails and especially the large slugs are regarded with much less sympathy, as they may inflict noticeable damage to vegetable and flower beds, not to mention fields and plantations. Not only the large slugs, but also their smaller relatives, are prosecuted with traps and poison. Poison applied to snails naturally also hampers animals that generally feed on snails, such as hedgehogs and toads. Are snails a garden pest? Other species, among them notably the Roman snail, generally are picked and eaten. The history of snails as human food can be retraced as far as to prehistoric times. Especially when food was rare peasants are said to have relied on the collecting of snails. From excavations at Roman sites we know that Roman legionaries distributed snails as transportable food in all of the Empire, which is why those snails, notable Helix species, colloquially are referred to as Roman snails. As did the legions of Rome, so did the soldiers of France during Napoleon's campaigns in 19th century Europe. Roman snails in hibernation close their shell with a calcareous lid, which means they are a natural food tin. 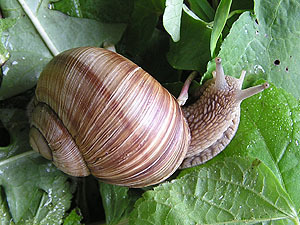 To be able to rise and sell snails in an economically feasible way, it is necessary to establish a snail farm, in French also referred to as Héliciculture. Actually these are only a few of the largest and most various group of molluscs. Altogether there are estimated to be as many as 43.000 species of snails, which is about 78 percent of all molluscs that by no means only live on land. Snails with a recognisable spiral shell can also be found in rivers, ponds and other fresh water bodies. So we often encounter pond snails (e.g. Lymnaea stagnalis) in garden ponds, where in contrary to their garden-dwelling relatives, they usually do not inflict any damage. In the sea, there are snails as well, as on land. There are snails on coastal rock faces, on the ocean floor in various depths, on coral reefs, and even on sea floor hot vents, where steaming hot water emerges into the sea. Moreover there are sea snails that, on the first sight, might not even be recognised as snails. So the nudibranchs with their colourful dorsal protrusions are snails as well as the ormer or abalone (Haliotis) that with its ear-shaped shell more resembles a mussel, than a snail. In English, snails and other sea molluscs provided with a shell are called just that – shells. gy of a Gastropod". Source: Livingstone, Biodidac, further editing: [RN]. Comparing the snail groups mentioned or displayed, besides characters typical for molluscs, there can also be found characters typical for all snails, whatever they may look like from outside. 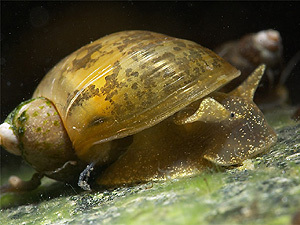 Most snails have got a noticeable muscular crawling foot with a flat sole, the animal uses to move slowly but visibly. 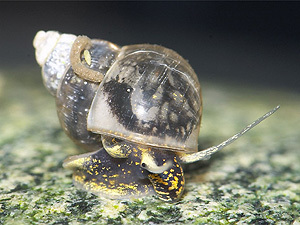 Besides this crawling motion, as it can be seen among ground-living snails from limpets up to terrestrial snails, there are many alternative methods of locomotion. So many snails also are able to use their foot for digging. Among sea snails, notably among sea slugs, there are species that can swim the free water. At a snail foot's front end, a head can be seen provided with eyes and a variable number of tentacles. Most (not all) terrestrial snails equipped with four tentacles, the remaining snail species only have two tentacles at their disposition, that may look like threads or even have the shape of ears. when the snail withdraws into its shell. At their foot's rear end many water living snails (and few terrestrial species) carry a calcareous lid (operculum) that closes the shell aperture, when the snail withdraws. 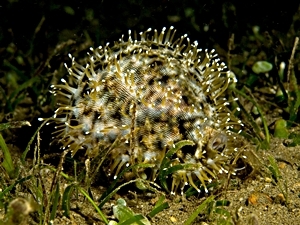 Using their sabre-shaped lid, conches are even able not only to defend themselves, but also to move in jumps by pushing their operculum into the ground and jerking themselves forward. Like other molluscs, snails as well feed using their rasp tongue (radula). From the composition of their radula and the shape of their teeth, different snail groups may be distinguished, such as the primeval docoglossan (meaning beam tongue) limpets or the carnivorous toxoglossan (meaning venom tongue) cone shells. The main function of the radula, whatever its appearance, bases on the same principle, a rasp tongue with tiny chitin teeth is used for food provision. The number and shape of teeth however is dependant on the type of nutrition, as it is among mammals. Herbivorous snails usually have many similarly shaped broad toothlets, the cone shell, on the other hand, having only one harpoon-shaped tooth, that, like a snake tooth, is connected to a venom gland and injects the venom into the prey's body. 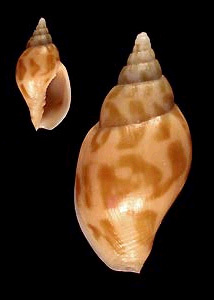 The shell of Lyria guionneti (Volutidae). Snails' shells mainly protect the snail's backside, but also several internal organs that are assembled in the dorsal visceral hump. As among other molluscs, among snails as well the shell is produced by cells of the mantle, the tissue coat protecting the snail's backside as well as its visceral hump. Originally snail shells differ noticeably from other mollusc shells, such as a Nautilus's, as they are asymmetrically coiled to one side of the body. 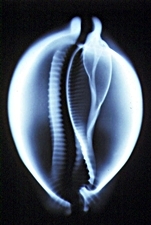 Basically the snail shell's form can be retraced to a process in the snail's embryonic development, during which mantle and visceral hump alike perform a 180° clockwise turn, so that the pallial cavity with the respiratory organs comes from a rear to a frontal position. This is the situation present among most sea snails, so those are called Prosobranchia (front gill snails). Among other groups after the torsion there is a counter clockwise detorsion, moving the pallial cavity to a position on the right side of the body, behind the heart. This situation can be found among the Opisthobranchia (hind gill snails) and Pulmonata (lung snails). d: pulmonate stage. Source: Urania Tierleben, Wirbellose 1. In primeval snail groups the two main neural pathways run straight and parallel from front to back. After the torsion, in the prosobranch stage, those nerves are crossed, a situation referred to as chiastoneury, those snail groups thus also called Streptoneura (crossed nerve snails). In contrary to that, after the detorsion the nerves lay straight and parallel again, which is why opisthobranch and pulmonate snails are grouped as Euthyneura (straight nerve snails). Most fresh water and land snails (scientifically referred to as limnic and terrestrial gastropods) maintain a special status, as their gills are reduced completely. Instead oxygen diffuses into the blood by the thin walls of a network of capillary blood vessels in the pallial cavity, which is why these capillary blood vessels are also called a snail lung, hence those snail groups are referred to as lung snails, scientifically called Pulmonata. Torsion and the Coiled Snail Shell. Though, this does not comply with the situation as it looks like since new snail groups were found near sea floor hot vents (already mentioned above). Those snail groups should belong to the prosobranch snails regarding the location of their respiratory organs. Though, other organ systems suggest a relationship closer to the opisthobranch snails. This discovery was supported by a new method of biological examination: molecular genetics and the comparison of genetic sequences. As a reliable scientific system has to show the evolutionary relationship between the groups in question, the prevailing gastropod system had to undergo a major revision, which has since then been undertaken mainly by Haszprunar, Ponder and Lindberg. As a consequence today there is a system, in which the gastropods are divided into Pulmonata and Opisthobranchia (grouped as Euthyneura) on one hand, and several streptoneuran groups on the other hand. it by x-ray. Besides, the mantle covers the shell in living specimens. (Source: Wikipedia). Apart from the characteristically wound snail shell there are quite a few other types of shells, that are not without difficulties to be recognised as a snail's shell. 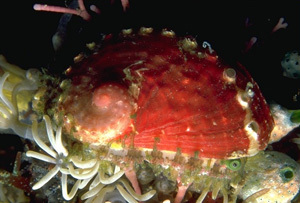 A limpet, for example, has got a noticeable spire only in its juvenile stage. Afterwards the spire disappears and the shell, by lateral growth, gets its cup-like shape, optimally adapted to life on rock faces in midst of surf. Cowry shells characteristic shell form develops when the outermost whorl grows over the rest of the spire, which is why only the outermost whorl can bee seen, the others situated in the shell's interior. Especially when at the end of the Middle Ages the great exploring voyages brought home information on many new kinds of animals, collections of sea shells became a common hobby among rich merchants and nobles. Many of these collections made the basis for today natural history museums' collections. Today, collecting shells for a hobby is so common that there is even a market for collective shells. On the other hand many, especially rare snail species, are threatened by extinction, as they are collected and killed for collections. That is why a responsible collector should think seriously about the ecological consequences of his collecting. The science of shells today is called conchology, in contrary to malacology meaning the biology of molluscs.